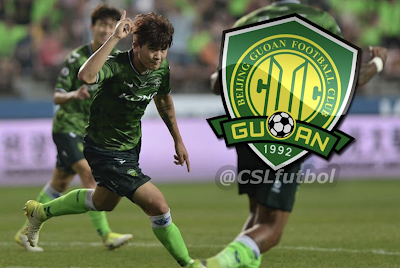 On Monday the 22-year-old defender Kim Min-Jae announced that he would be leaving Jeonbuk Motors to join the Chinese Super League side Beijing Guoan. The player leaves the Korean champions after two successful seasons in which he made 60 appearances scoring three goals. After a good Asian Cup despite his country ultimately failing he had an impressive tournament for South Korea. This was seen as he was commanding at the back and strong attacking corners, we saw this with him picking two goals up during the competition. The defender as a bright future ahead of him and has been talked up by many who follow the K League closely. Fans of the Korean game and the national side did hope the player would move to Europe and develop further. He picked the CSL instead and it will be hoped at this level he will flourish with that move to Europe still very much on the cards in the future. If a move to Europe was a possibility at the moment is a little unclear too, as many suggested Watford wanted the centre-half. Despite this being reported with Javi Gracia the Watford boss quoted as saying to the local press. I don’t know anything about this player. I have listened to something about him, it was not in the club, out of here somewhere. At this moment I have five players as centre back, maybe six with Ben Wilmot also as a centre back as well. We have enough players, enough good players to play this season.